Gov. Linda Lingle, in a significant concession, said yesterday that the state should tap its "rainy day" fund and teachers should agree to give up planning and collaboration days to end teacher furloughs. Gov. 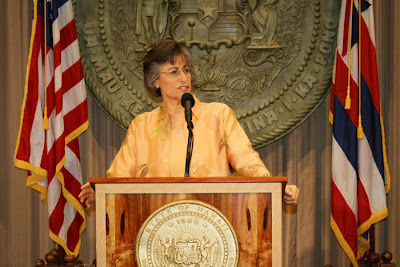 Linda Lingle on Sunday announced a plan to restore 27 school furlough days over the next year and a half. Three legislative committees will jointly examine budget cuts to the state's Healthy Start program on Monday. Only one Republican is running for lieutenant governor in Hawaii next year while a handful of Democrats are actively campaigning for their party's nomination. Having retrieved 22 iwi po'o, or Hawaiian skulls, from Stockholm's antiquities museum over the weekend, a Native Hawaiian delegation arrived in Boston yesterday to take possession of eight more from Harvard University's anatomical collection, William Aila, the group's spokesman said last night. Despite the down economy, the North Kona Coast's luxurious Hualalai Resort sold a record $43.5 million in real estate in August and is on track to close $130 million in transactions by year's end. Heavy rains brought serious property damage to Oahu this weekend. Heavy rains and flooding over the past few days has caused water service interruptions for county Department of Water customers in Hanalei town and parts of Wailua Houselots. Hawai'i and China may reach agreement by the end of the year to feature Island products at a showroom in Shanghai, Gov. Linda Lingle said yesterday, which could help small and medium-sized businesses gain a foothold in the world's largest market. Ordinarily, once a developer gets a special management area permit, the rest of the path to construction is routine. But SVO Pacific Inc., the developer of the Westin Kaanapali Ocean Resort and Westin Kaanapali Ocean Resort North at North Beach, has had its SMA permit since March 2008 for a nearly identical third resort next to the other two, but it has not been able to get building permits.